Transform a scene into a miniature world. This application simulates a tilt-shift lens that tricks your mind into viewing a photo as a miniature scene like a model railroad for example. Tilt-shift miniature faking is a process in which a photograph of a life-size location or object is manipulated so that it looks like a photograph of a miniature scale model. 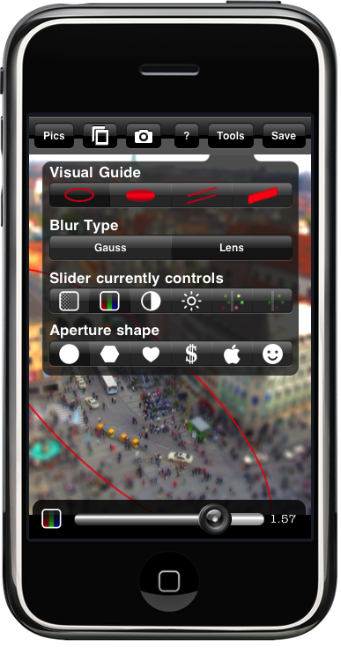 Focus on a linear or elliptical region in the image with visual guides and interactively adjust the amount of blur for maximum effect. Increase color saturation, contrast or brightness to increase the toy model look. Create a nice bokeh effect with the lens blur filter in night scene photos. Blooming strength and threshold are adjustable. You can even choose a shaped aperture (hexagon, heart, dollar sign, etc.) if you like. and rotation of two fingers around a common center. Practice with dozens of images that are included or use the camera and photo roll. The resulting image can be saved in high resolution. Both portrait and landscape mode are supported. Please have a look at a video review by Vu Bui, a photographer and cinematographer from Southern California. This review demonstrates nicely how TiltShift can be used.